Damrey and Nakri are two Asian elephant cows residing at Finley Memorial Zoo near Vancouver, Washington. As Iris Oakley walked towards the Commissary after her night volunteer shift, she heard noises coming from the elephant barn. It was 7:00 a.m. and Iris was possibly the only human on the grounds of the zoo. As Iris got to the elephant barn, she found Damrey very agitated with a person face down in the stall with the elephant. Iris Oakley’s husband was killed at the zoo. Iris is pregnant, has no training with elephants, and does not have the slightest idea of what action to take. Iris managed to reach Sam who was in charge of the elephants on her cell phone. Sam instructed Iris as to how to handle the elephants until he arrived and Iris did the best she could. She finally was able to coax the elephants into a stall and away from the body. The body on the floor of the elephant barn was Kevin Wallace, her boss. Although Wallace was still alive when rescued from the elephant barn, he later died of his injuries. The police decide that Damrey is the murderer but others at the zoo were not convinced. Things are unsettled at Finley Memorial Zoo. Animal rights activists who want the elephants sent to a sanctuary are picketing the zoo. Soon other incidents happen that can’t be explained. A zoo van is stolen along with the body of Rajah, a tiger, which had died that was in the van. Then two turtles disappear from an exhibit. Iris and her friends speculate but no one can come up with an answer. Iris is nominated by her friends to find the underlying cause of the murder of Kevin Wallace and discover who is behind the incidents at the zoo. 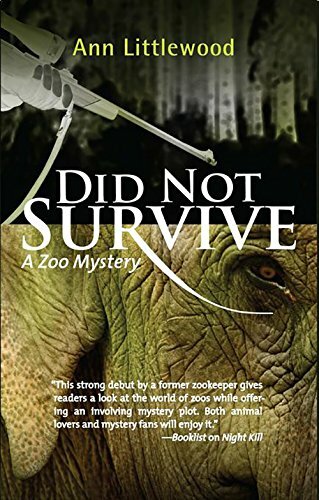 Did Not Survive gives readers an inside look at life from the eyes of zoo employees and information about the lengths that some animal rights activists will go to whether they are right or wrong. The mystery presented in Did Not Survive is a good one and the setting unusual. The author worked as a zookeeper at the Oregon Zoo for twelve years and is a life-long environmentalist. If you enjoy Littlewood’s writing, you will want to look for her previous book Night Kill.